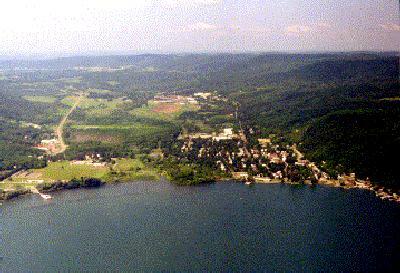 The Village of Hammondsport is located on Rt 54 at the head of Keuka Lake. In 1827 Mr.Hammond realized the development of his community should have a plan. So he had a surveyor named Read lay out the streets for the Village and named it Hammond's Port. Hammondsport is known as the "Cradle of Aviation." Glenn Curtiss, who was born here on the 21st of May 1878. Curtiss opened his own bicycle shop. He not only proved to the world his confidence in man's mastery of the air with his kitelike plane, (the June-Bug) with its flight of July 4th 1908 , but, also, was successful in building and riding motorcycles. He developed a start of what has become the modern travel trailer...both tent and house type. Shortly before his death in 1930, Curtiss was working to develop one of the first motor homes with four wheel drive. Explore the life of Glenn H Curtiss at the Curtiss Museum in Hammondsport. Wine making has played a major roll in this region, and many large and smaller independent wine companies have and now exist. The area is known as the Wine country. Copyright © 1996-2015 [GLSaltsman Enterprise ]. All rights reserved.